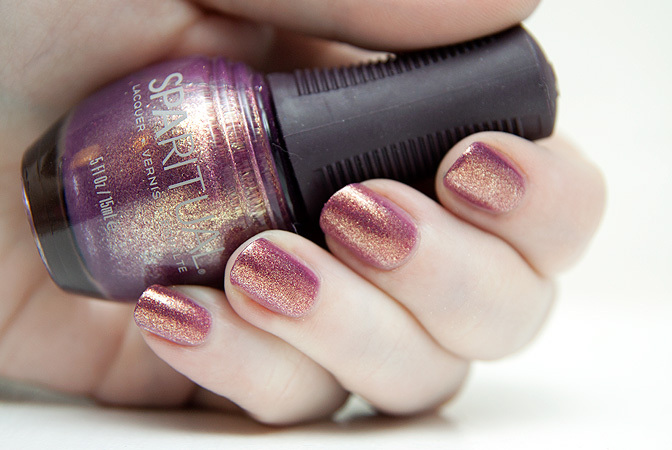 Vegan nail brand, SpaRitual have released a Cancer Awareness Collection of nail polishes comprising three absolutely beautiful pink shades. Knowledge, Strength and Clarity sparkle, shimmer and shine in the best ways possible: A holographic pink glitter, a solid pink glitter and a pink foil with golden shimmer. Amazing. 20% of all proceeds from the sale of these three shades will be donated to CancerSchmancer, a U.S. based charity focused on supporting early cancer detection. the 2nd nail polish look similar to OPI and zoya. Which one is the one in the second swatch picture? I like that a lot! Strength is gorgeous. Me likey lots. I would order, but p&p is £7.50 which is just ridiculous. £7.50? That’s a nonsense price for retail customers – fair enough if you’re trade and want to buy loads but what an absolute shame. Yeah, exactly. If I was ordering 15-20 of them, fair enough, but just one, nope. So as pretty as it is, I’ll not be bothering, even if it’s for charity. Just tried to order ‘Strength’ but seeing as they want £19.50…*bangs head against wall*. Deal Alert: Space NK 50% off Sale - My Picks! Brrrr, wrap up warm – it’s a cold one here today!